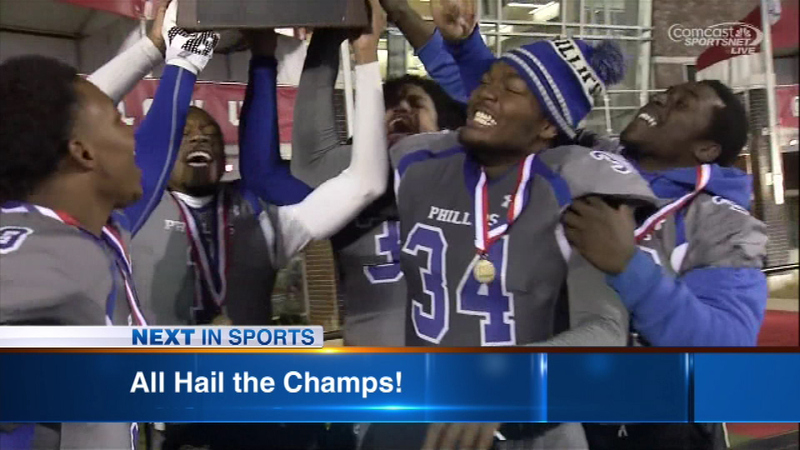 CHICAGO (WLS) -- The Phillips Academy High School football team made history Friday night with a 51-7 victory that made them state football champions. The Wildcats win marks the first time a Chicago Public League school has ever won the Illinois High School Association's state championship game for football. Mayor Rahm Emanuel issued a statement after the win: "Before today, no Chicago Public Schools football team had ever won a state title. Tonight, the Phillips Academy Wildcats ended that drought. They have proven to be the true definition of perseverance and determination. More importantly, they are the definition of 'team.' Tonight, we celebrate them as the pride of Bronzeville and all of Chicago. Congratulations to Coach Troy McAllister and his team on not only a perfect season, but on securing a spot in Illinois' sports history." This is the second straight year that the Bronzeville neighborhood team has fought for the 4A title, losing last year. Quarterback Quayvon Skanes did it all with 141 yards on the ground and four touchdowns. The Wildcats beat Altoff Catholic High School.